Protect yourself and your family from the dangers of carbon monoxide poisoning with the Atwood Digital Carbon Monoxide Alarm. 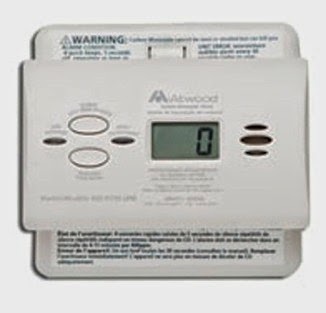 This CO alarm is an updated version of the Atwood 32519. It works the same way, simply featuring a different design. The Fuel Cell technology used by the Atwood CO alarm ensures that the readings are more accurate, as it is less sensitive to other gases. If CO is detected, the alarm will sound, making sure that you and your family are made aware of possible danger. For added convenience, it can be mounted to the wall or ceiling. Make sure that the detector is mounted in a place where you can easily read the display, and that it is not blocked by anything else. This detector is made to last for years before wearing out. The real threat of carbon monoxide comes from the fact that it is odorless and invisible. It can come from a number of sources, most commonly from furnaces or other heaters, generators, or dryers that are not functioning properly. Unless you have a CO detector in place, chances are you will not be aware of it. Common symptoms of CO exposure include headaches, drowsiness and nausea, and is fatal in high amounts. It is important to remember to test CO alarms to make sure they are properly functioning. It is also a good idea to place them near sleeping areas in the case of an emergency during the night. Keep in mind that a CO detector does not take the place of a smoke / fire alarm.